It’s time to go green this weekend, as St. Patrick’s Day celebrations return to Dubai for another year. Sunday 17th marks the day itself, but don’t worry – there’s plenty taking place over the next three days to ensure you celebrate this special day right. Dubai’s popular Irish pub is hosting a free, three-day festival, promising fun for the whole family this weekend. Celebrators can expect live music all day long at the event’s family day on Friday, featuring performances from The Logues, The Real Shindig, Yeh Yeah Nah and DJ Marky Mark. What’s more, there’s a petting zoo, bouncy castle and face painting for the kids. As a warm up for the big day itself on Sunday, Saturday will see additional performances from the bands, as well as traditional Irish dancers to get everyone on their feet. Happy hour will run from 4pm-7pm each day, with drinks from AED 35. Details: Free to attend, The Irish Village Garhoud will be open Friday 11am-2am, Saturday 11am-1am, and Sunday 11am-midnight. Four days of celebrations has been promised at this JBR hotspot, featuring a myriad of musical treats, live entertainment and a magnificent themed food and beverage menu. Throughout the weekend, guests can get stuck into the Leprechaun set menu at the price of AED 129 per person, featuring Shamrock classics including Irish mussels as appetiser, roast beef, Irish stew, beef and Guinness pie as mains, and Guinness chocolate mousse as a dessert. A choice of five Irish cocktails, such as Dublin Martini, Irish Coco Cream and Sparkling Shamrock, will also be on offer throughout the celebrations. Happy hour from 4pm-8pm daily. Details: McGettigans JBR at Hilton Dubai Jumeirah is open all weekend for St. Patrick’s Day celebrations. For more information, visit the Facebook event. On Friday, March 15th, the much-loved sports bar will be hosting a brunch and drunch package with two separate timings in honour of the friendly folk from the Emerald Isle. Featuring a traditionally Irish menu and several Irish-themed competitions, this St. Patrick’s Day celebration is a true pot of gold. The menu will feature a large selection of moreish dishes, including Irish classics such as Steak and Guinness Pie and Irish Lamb Stew followed by Irish Whisky Truffles and a creamy and delicious Baileys Cheesecake – all served alongside a three-hour beverage package. Details: The midday brunch runs from 12:30pm to 3:30pm, and the evening brunch runs from 7pm-10pm at Girders Garden, JA Ocean View Hotel JBR. All brunch packages are priced at AED 249 per person. Call 04-814 5590 or email eatout.ovh@jaresorts.com for bookings. This all-American smokehouse venue is ‘going green’ for St. Patrick’s Day with a special Thursday night brunch, kick-starting four days of Irish-inspired celebrations including one-off Irish drink offers all weekend. The four-hour, unlimited three-course brunch will run from 7-11pm, serving up loads of meat, potatoes and an American twist, courtesy of Chef Orelle Young and Ol’ Betty, the restaurant’s legendary meat smoker. Details: Packages start from AED 219 including soft drinks. For bookings and information, please email info@theblacksmithdubai.com or call +971 4 407 8873. For the whole month of March, enjoy a traditional Irish stew, paired with a traditional Irish brew for only AED 99. Wash all of that down with various Irish themed beverage including a chance to win AED 2,000 daily! 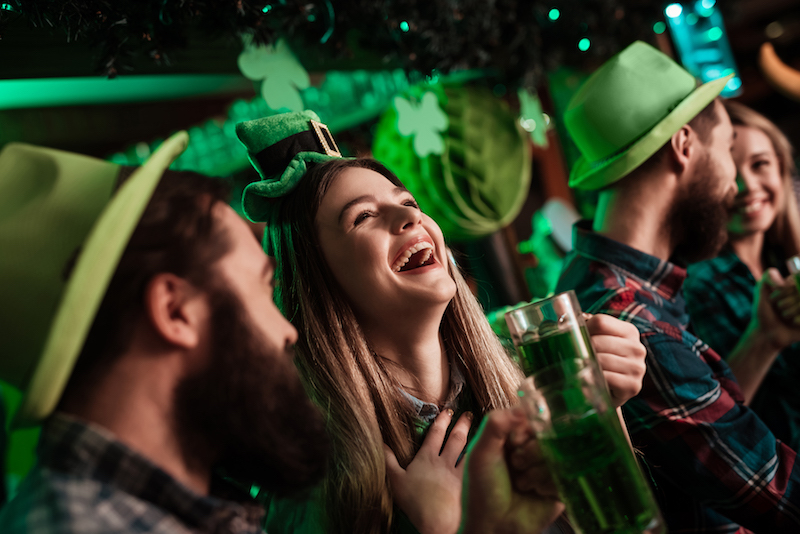 Guests at this Al Habtoor City pub on Sunday can expect green beer, leprechauns, fun games and lots of exciting prizes. Foodies can indulge in St. Paddy’s specials like Irish style lamb stew served with Irish champ, herb crusted seabass served with Irish cabbage, beef and Guinness hot pie, apple pie among other things – available all throughout the weekend at a special price. An Irish quiz night will be held from 8pm onwards, with prizes of up to AED 2,000 to be won. Not just that, but there will also be a special beer challenge, darts tournament as well as an exciting game wherein every table gets to pick a chit that decides what’s in store for the winner! Details: Irish specials will be available from 11am-1am on Sunday 17th March. For more information, call +971 4 437 0022.